Jacob Kass (1910-2000), American Folk Artist and father of Ray Kass, painted on tools of all sizes and shapes -- handsaws, circular saws, ice saws, coping saws, sickles, corn cutters, and carpenter's squares. Kass experienced America through the turbulent years of the depression, World War II, and the cold war, as well as the struggles for civil and women's rights, but he chose not to focus on the problems of the world. Instead, he illustrated people at work and at play in idealized rural and urban settings. His dense cityscapes show buildings and rooftops, pushcarts, moving days, baseball games on corner lots, and kids playing hopscotch. The pastoral works feature barns and outbuildings, farmers sowing the fields, horses frolicking in meadows, and people skating on ponds. His settings were based on composite memories of half a century spent in Brooklyn's East New York neighborhood and his retirement in Vershire, Vermont, and Largo, Florida. Kass generally maintained a distance between himself and his subjects, and his panoramic scenes reveal a reverence for nature and rare sensitivity to the rhythm of the seasons and daily weather. 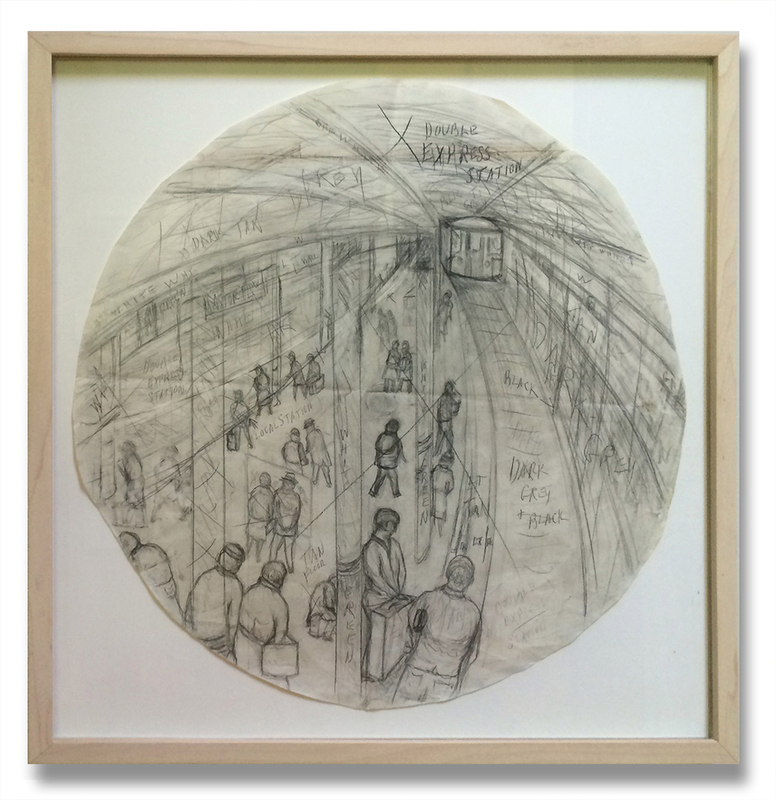 His works are elegant views of everyday life magically transformed into personal tone poems. Jacob Kass was born in Brooklyn, New York, in 1910. A second generation artisan sign and letter painter, he worked for nearly forty years in the business his father started, retiring in 1983. After his retirement to Vershire, Vermont, Kass became interested in repairing, decorating, and reselling furniture and accessories he bought at flea markets and auctions. His early embellishments on milk cans and frying pans soon gave way to delicate scene-paintings on saws and other cutting tools, culled from five decades as a sign painter. Beginning with a depiction of his Vermont house, he painted landscapes and scenes of his New England surroundings, memories of his Brooklyn neighborhood, and idealized scenes of Largo, Florida, where he spent winters with his wife. Widely heralded, Kass received a grant from the National Endowment for the Arts, in 1981. He was honored with solo shows at the Tampa Museum of Art (1994), Mennello Museum of Folk Art (1999), and the American Folk Art Museum (2002). Kass died in 2000. A synthesis of whimsy, practicality, and precision, Jacob Kass’s found-object paintings call upon his sign-painter roots, but thwart utility for pastoral visions of the American experience. Interested mainly in the New England landscapes around him, the Brooklyn of his childhood, and panoramas of tropical bliss in Largo, Florida, Kass imbued each with a nostalgia and idealization that make us yearn for a simpler time. The panoramas, which often show buildings and scenes of daily life, have an overarching reflexivity, in that, the very buildings shown could have been fashioned by the tools on which their likeness is now reproduced. While the use of found materials recalls American Folk Art, the scenes themselves are reminiscent of 1930s Regionalism, the Hudson River School painters, and, most closely, the Dutch genre paintings of Pieter Bruegel the Elder. 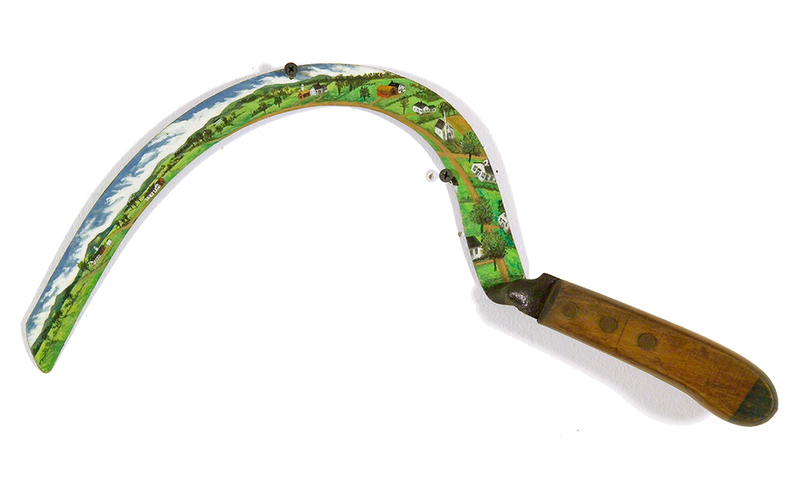 "Saws, Sickles, Squares, and Tongs: Paintings by Jacob J. Kass"
"Working the Blade: The Painted Saws of Jacob Kass"
"Painted Saws : An Exhibition"
Kass's medium of choice was the handsaw. He painted on all types, including regular saws, hacksaws, and ice saws, and inserted painted wood panels on bucksaws and coping saws. He used other tools as well, including sickles, hay knifes, and carpenter's squares; he even inserted a painted panel in the grip of a set of ice tongs. Kass's interest in tools came from a lifetime of experience as an artisan. In the more than 45 years he spent as a truck painter, Kass often worked seven days a week. When he retired in 1963, he said, "[I] didn't want to look at a paintbrush again. . . . I figured I owed myself some relaxation and pleasure in life." But he found that he enjoyed going to flea markets, buying old furniture to fix up and sell and old milk cans and frying pans to paint. 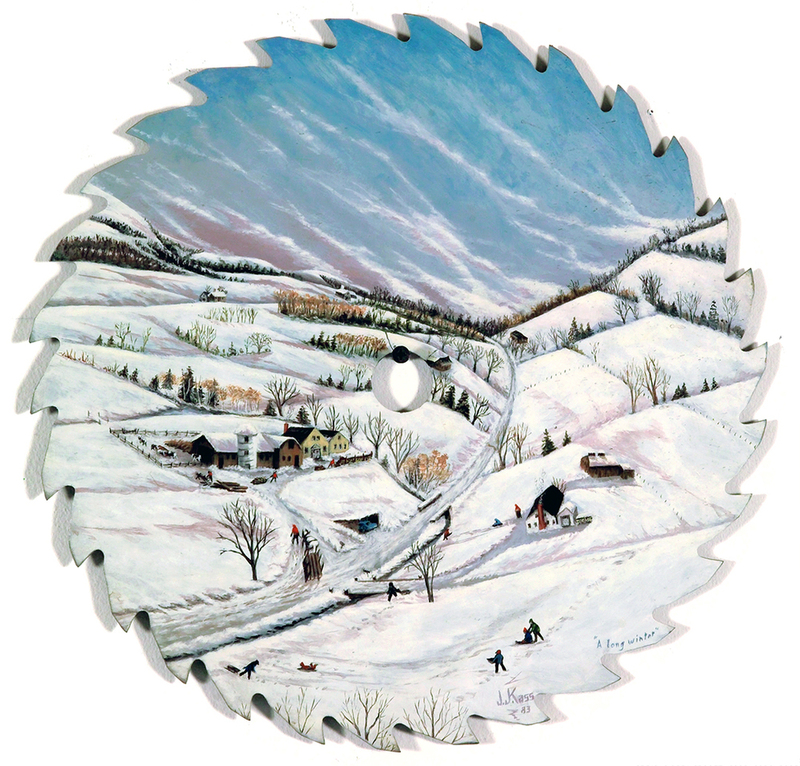 "In 1977 I decided to paint a picture of my place in Vermont on an old handsaw from my shed. I enjoyed doing that an, having a dozen or so old saws on hand, I started to paint the things I saw around me in Vermont on them. People liked them and would ask me to paint on for them. Now in my retiring years, I am fulfilling my lifelong ambition--painting what I want to paint for the pleasure of it and not because I have to." Painting on saws was hardly a stretch for Kass. Back in Brooklyn he had painted landscape murals on the walls of his home and, of course, he had painted images of all sorts on trucks. He knew the technology of painting as well as any full-fledged fine-art professional. 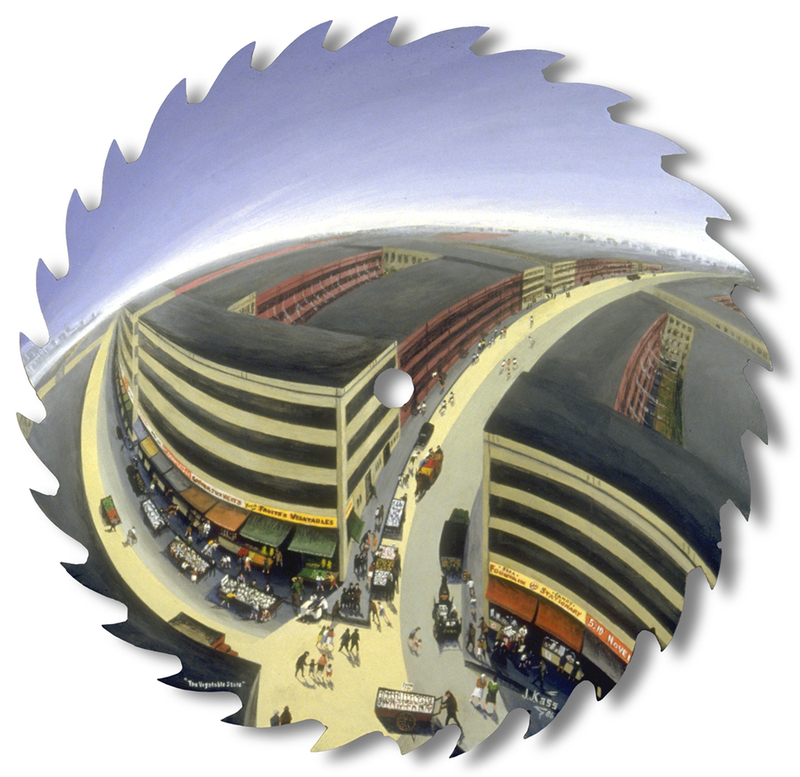 Moreover, the long saw blade itself was a natural for the panoramic vistas Kass favored and his experience fitting words and images to the nonstandard surfaces of truck bodies served him well. In the hands of another artist, saw painting might have been just a gimmick. Kass brought to the saw well-developed craft skills, and he also responded to the shape of the saw -- as well as to the shapes of other tools like hacksaws and carpenter's squares -- with great formal ingenuity. The Milk Wagon, 1984; Ice Man, 198? ; Pushcarts, 198? Most immediately catchy is the play between the object and the illusionistic painting. 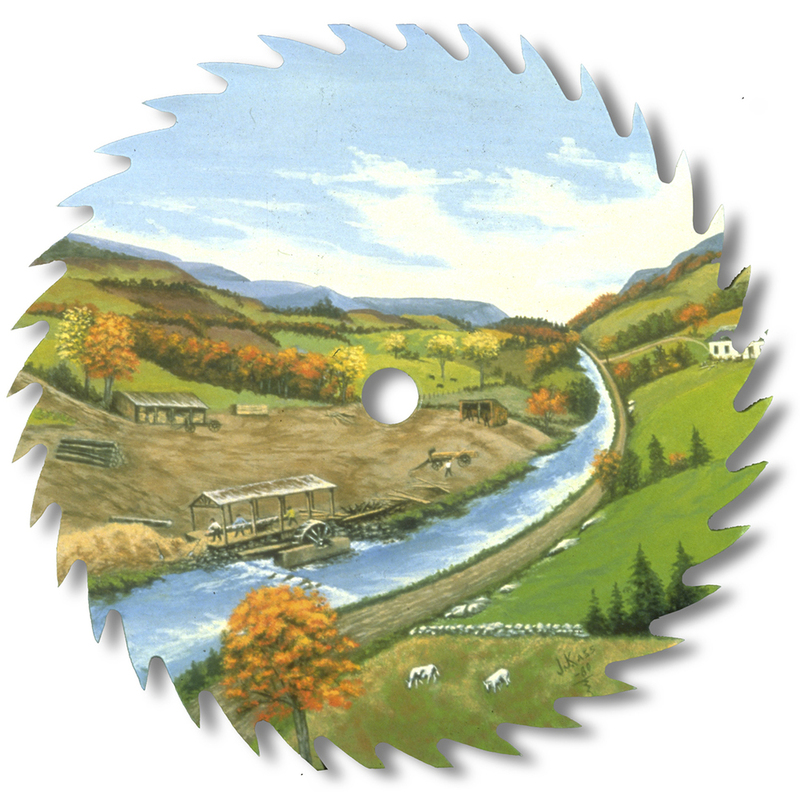 The saw blades turn into trapezoidal windows through which one peers into other worlds, where cow and barns punctuate country roads and fields and light-flooded hills roll into the distance. As a painter, Kass didn't do anything too fancy. He was neither a miniaturist nor a super-realist, but he gave the paint an appealing glossy substance. Except for the sketchy, doll-like people populating his scenes, he gave everything -- natural topography, buildings, sky and clouds -- a palpable realism. Kass's compositional inventiveness shows particularly in city scenes, where the tapering blade acts as a counterpoint to the slanting perspectives of streets and buildings. In Moving Day (1987), we look down into the backyard of tenements near the saw handle and beyond to a yellow-lettered red van parked outside a building across the street. Buildings recede toward the blade's narrow end, but the street recedes as well toward the upper part of the wide end. The crisscrossing perspectives and the architectural geometry create an almost Cubist picture. Drawings on saw-blade-shaped pieces of paper show that Kass worked out his compositions with care. One of his more delightful formal performances is a farm scene executed on the whiplash blade of a grass scythe. Back to the Barn starts near the handle with an overhead view of a man herding a half-dozen cows along a dirt road. Farther along the blade the road recedes and the view expands to take in farm buildings, cultivated fields and, near the pointed end of the blade, faraway hills under clouds streaked pink by the setting sun. 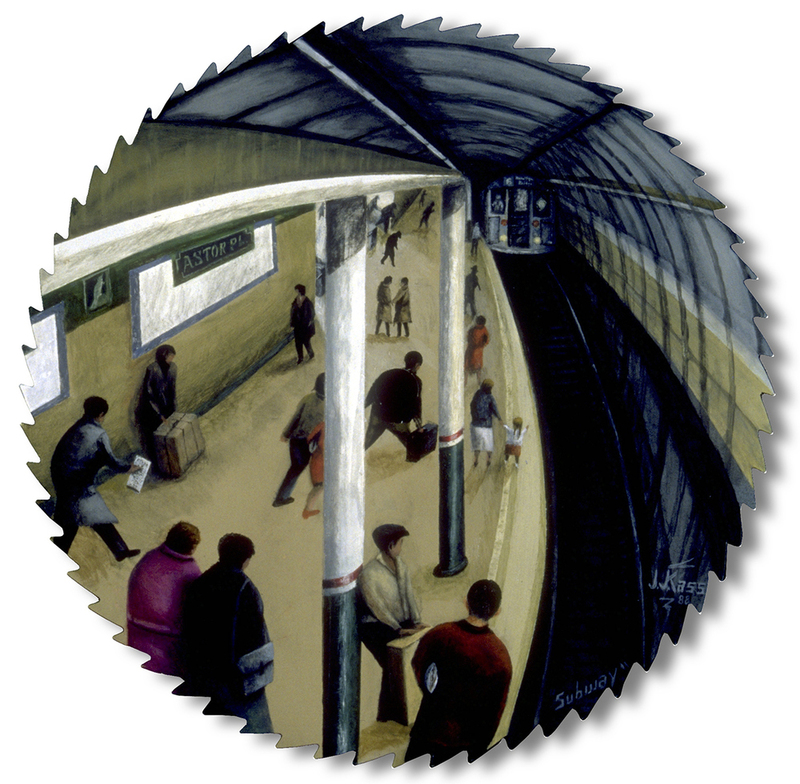 Kass also painted on circular saw blades, adjusting the lines of the composition to spiral around the hole in the center, as in a painting of a New York subway station. The way Kass worked with shape and composition appeals to eyes trained by Modernist precepts. One also notes a conceptual play on the view as a slice of life -- cut out, one imagines, as though by a saw belonging to René Magritte. Kass's craftsmanship is evident in every stage of his working process, from preparation to presentation. The preparation methods he used for his art making were just as rigorous as those that had been put to use on the trucks in the old paint shop. First, he carefully removed the handle. Second, he ground the front and back of each blade with a disc grinder to remove all rust and uneven surface. Then, he applied a metal primer (made by Shecoloin or Dupont) using an oxhair brush and sprayed varnish or lacquer over the primed surface. He generally painted his scenes with Bocour Magna acrylic paint, using oil paint for details. He covered the back of the blade with either gray or black primer, or more often he left it unpainted. Finally, he sprayed varnish or lacquer over the surface, sometimes adding his signature and the work's title. Because of all this, his saws remain in excellent condition. The bustling and remarkably detailed Pushcarts (1983) features a row of named shops, including Tony's Barber Shop, Ace Cleaners, and Howard Clothes, along with stores bearing more generalized labels -- the 5 and 10c Variety Store, Kosher Meat Market, Dress Shop, Pharmacy. In the upper right edge near the saw's handle, a red Habacker Moving and Storage truck is parked behind a horse and wagon. Another horse and wagon, this one bearing the logo of the New York State dairy Ferndale Farms, is parked in the mid ground, its driver approaching an apartment building. A cluster of Hasidic Jews engage is a business transaction; a man wearing a sandwich-board sign advertises a local eater; another man sells clothing; a woman pushes a baby carriage; a peddler with a cart sells knishes. The image is apparently a composite of several scenes observed by Kass in a around Brooklyn and Manhattan over a period of many years. According to city directories from between 1930 and 1955, Howard Clothes, Tony's Barber Shop, and Ace Cleaners were real businesses, but they were all located on different streets; some were on Pitkin Avenue in Brooklyn, while others were on Grand Street on Manhattan's Lower East Side. The horizontal stretch of a length of multicolored awnings and store signs follows the length and shape of the blade, with the street intersection occurring at the aid end, nearest the handle. In Roofs (1985), the gray, placed sky, the gray-green open area, and a misty distant town set off the stylized arrangement of the orderly diagonal rows of roofs and sides of commercial and civic buildings and factories. A church is positioned below the wooden handle of the saw. The grayish pastel colors lend an ambitious serenity. Kass's attention to the curve of the upper blade is emphasized by the note on his drawing for this work to "curve clouds with saw" along the sky edge and to "curve with saw" along the mid-horizontal line of roofs and landscape. The Corner Lot (1991-1992) shows another mood is Kass's oeuvre. The deep shadows and abstracted forms create an atmosphere similar to that of an Edward Hopper painting, one that stands in contrast to the vigor and joy of the ballgame on the corner lot and of the game hopscotch across the street. The large faded Castoria advertisement painted on the side of a building sets the tone of a bygone era when the product, a laxative, was well-known and popular. The slogan "Castoria/Children Cry For It" adds subtle humor. Kass's draftsmanship and compositional ability is manifest in the extension of the painted picture surface to the saw handle and to the tiny, foreshortened Ferndale Dairy wagon moving up the street. Two Horses in the Meadow (1979), Town View (1983), Sowing the Field (1987-1991) and Moonlight in Vermont #1 (1979) are Kass's paeans to the pastoral New England landscape. The first two works, in particular, evoke feelings of a peaceful world. The sunny green meadows and fields of the first three pieces contrast with the ice skater in silhouette, bathed in ethereal light from the gray-blue moonlit sky in the atmospheric night scene presented in Moonlight in Vermont #1. Sowing the Field, executed on a large circular saw blade, reveals Kass's skill in creating movement with line. Normally tranquil fields are energized by abstract banded and swirling patterns of land an sky that follow the circular motion of the jagged saw teeth that seem ready to propel the blade from right to left. 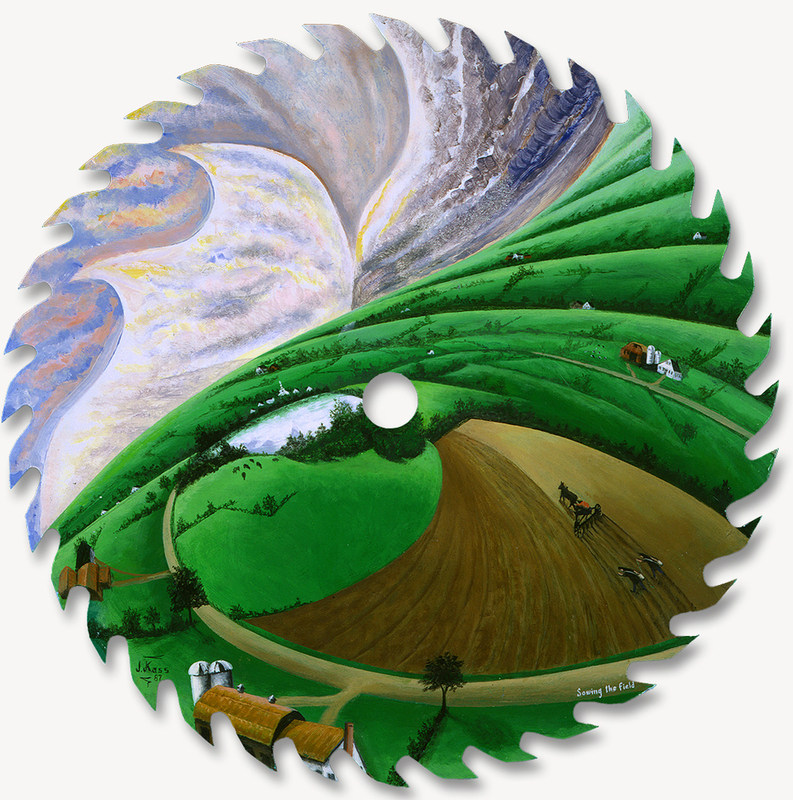 The tiny farmer working the land with his plow draws the viewer's eye directly into the central vortex. The stillness of the lake near the center of the work seems to emphasize the movement of the dynamic fields and sky. Though Jacob's artist son, Ray Kass, knew about many of the preliminary sketches, it was only later discovered that Jacob prepared a drawing for virtually every tool he painted (just as he made cartoons or ponces for truck patterns), and then numbered, titled, and signed the drawing. He did not trace the drawing on the blade or panel surface; there are no carbon marks on pinpricks on any of Kass's artworks. He almost certainly "eyeballed" or copied directly from his sketch, carefully folding the drawing and tucking it away until needed. To make a pattern for each blade or panel he planned to paint, Kass used tape to enlarge his paper modeling surface, then trimmed the shape to the tool blade's exact size. Most of the drawings show evidence of tape on the top edge, suggesting that Kass taped up his drawing to copy it on the blade. The effects of time on the paper and the yellowing of Scotch and masking tape bring to mind the drawings of the post-modern German artist Joseph Beuys. Kass may not have considered his drawings works of art, but they, nevertheless, deserve recognition as such. The vitality of the images, the obvious speed and confidence with which Kass moved his pencil over the surface, his ability to alternate from scenes crammed with detail to delicate and spare images, and his choices of style for each subject are remarkable. Kass enjoyed notable recognition and success during his lifetime. He was represented by and exhibited at the Alan Stone and Nancy Hoffman galleries beginning in 1981. Two exhibitions in Florida -- at the Tampa Museum of Art in 1994 and at the Mennello Museum in Orlando in 2000 -- brought his art to a broader public. 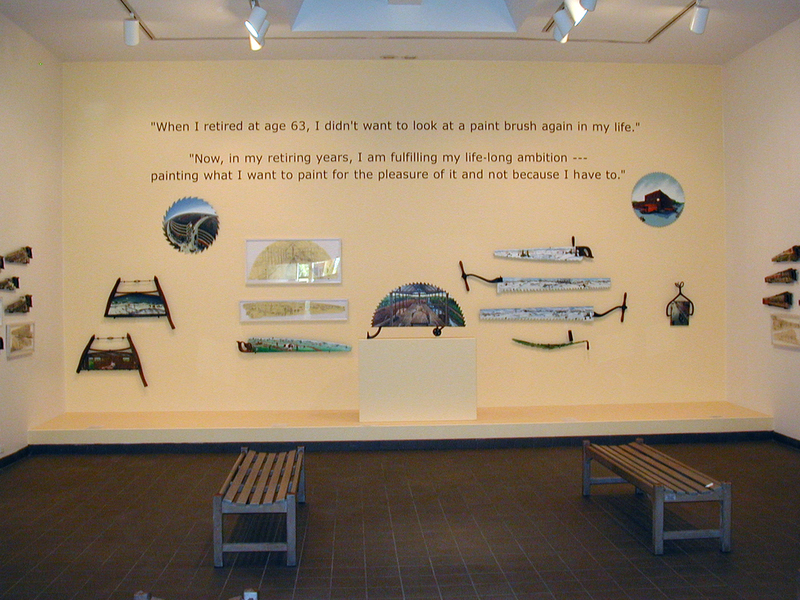 Kass's exhibition at the American Folk Art Museum's Eva and Morris Feld Gallery in 2002 was the first museum exhibition in the Northeast to show his painted tools and drawings. At the heart of Kass's pictures are moral values integral to American culture and the American spirit. His images celebrate the value of work, the beauty and power of nature, and diversity in our population. Their beauty and coherence, the directness of their expression, and their workmanship will give pleasure to many viewers and will increase the respect of this undersung visual artist.